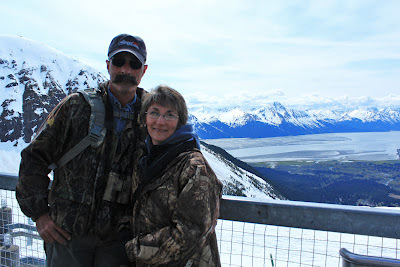 My husband and I just returned from a brief, but wonderful trip to Alaska. We met some of his family in Anchorage and for the next four days tried to pack as many activities into the long daylight hours as our bodies would allow. Alaska has long been on our list of places to visit and my father-in-law did an awesome job of putting together places for us to explore and unforgettable adventures to experience. We brought back a life time of memories and hundreds of photos and can't wait to experience it again. From an artists standpoint the scenery was mind boggling. I was in overwhelm most of the time we were there. 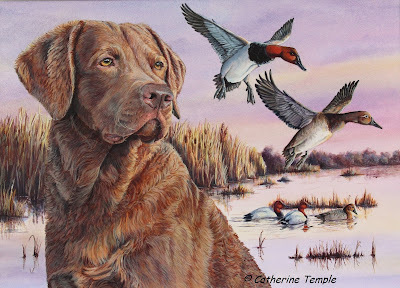 The wilderness and the wildlife gave me more inspiration for my artwork than I will ever live long enough to paint. I tried to take photos of everything, but had also hoped to have time to sit quietly and sketch what I was seeing because a painting conveys much more feeling about something than a photograph ever will. Unfortunately, our schedule didn't allow much quiet time so after we got back home I sat quietly in my studio, gathered some of the photos and let my mind drift back to my impressions of the wildness there. Our first day there we visited Potter Marsh. 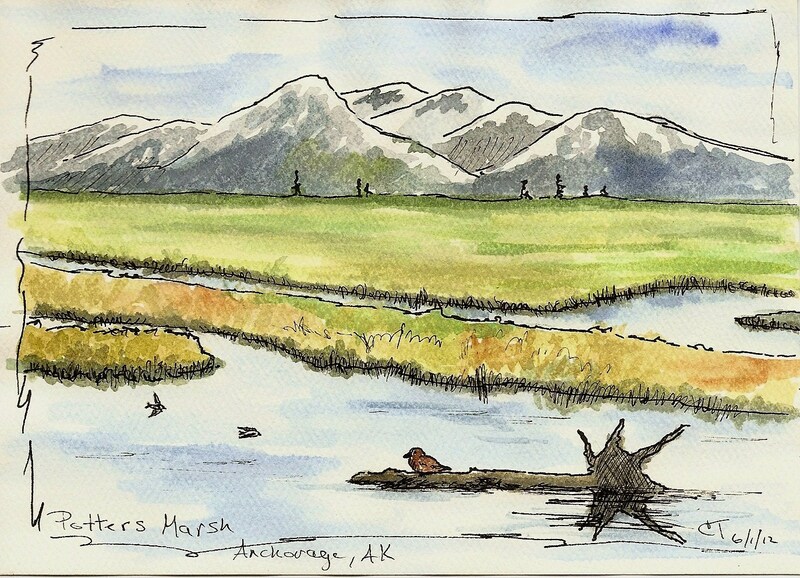 It's an amazing wildlife sanctuary along the Seward Highway with elevated boardwalks going out into the marsh allowing you an up close and personal view of the marsh and it's many inhabitants. I could have easily spent the whole day there. One creature that particularly caught my attention was the Arctic Tern. 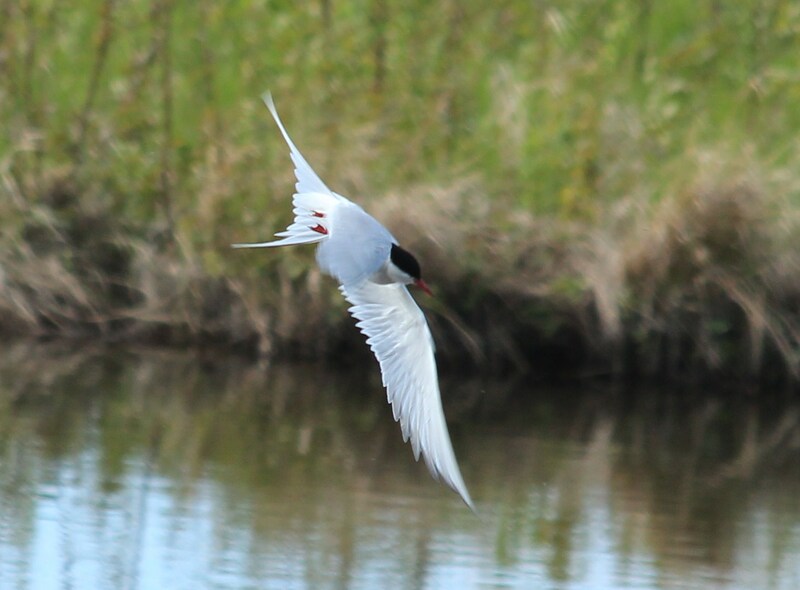 It's an elegant looking bird that migrates over 25,000 miles from the Antarctic to nest in this area. It would hover above the water looking for fish then plunge in after them. The next days activities included a flight around Mt. McKinley with a company called K2 Aviation. The weather cooperated and was fairly clear and sunny and the mountain itself gave us glimpses through the clouds that seem to always surround it. Our pilot was top notch and gave us stunning views of the glaciers and jagged rocks that make up the Alaska Range. 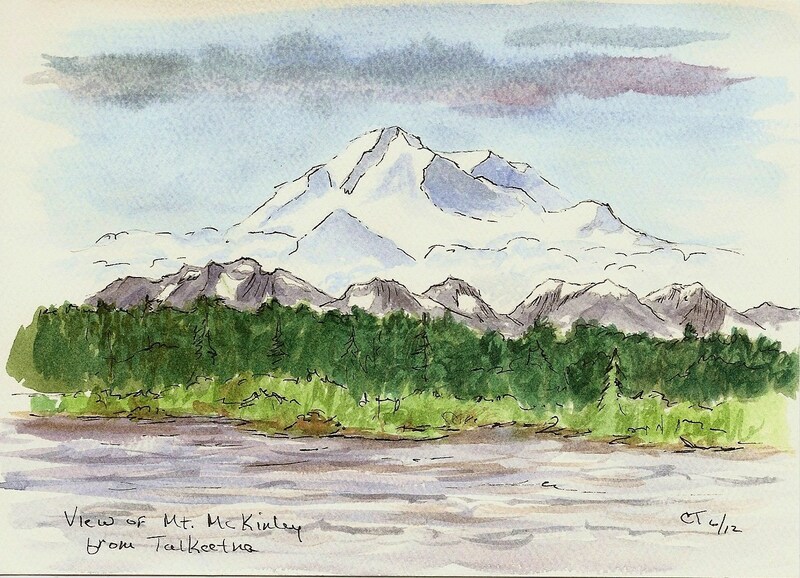 That evening we spent at the Roadhouse Inn in Talkeetna. Before going to bed we walked down to the river and got an excellent view of Mt. McKinley towering over the rest of the mountain range at over 20,000 feet. Most of the other peaks are at about half that height. One of the other highlights of our Alaskan adventure was a guided bus tour into Denali National Park. We were just at the beginning of the spring season so not too many wildflowers were in bloom yet, but the tundra and the taiga were still spectacular. We saw Dall sheep, moose, and caribou at fairly close range though no grizzley bears or wolves were spotted that day. 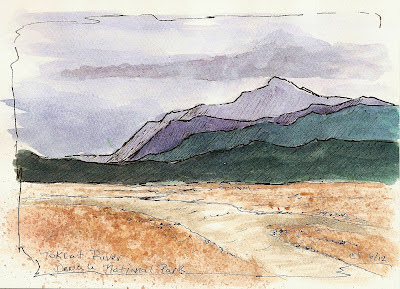 One of my favorite places along the tour was along the Toklat River with views of the Polychrome Mountains. It had a particularly moody feel to it as storm clouds moved in and rain descended upon us. All too soon our adventure came to an end. Alaska had always been a place of our dreams and now still is. There is so much of it still to explore and we are already planning a return trip, hopefully, for next year, but with a little more time in the schedule for more in depth exploration.